If sources are to be believed then Triumph is planning to introduce the Speed Triple 1050R in India soon. The British superbike manufacturer has already imported a unit of the Speed Triple 1050R in India for homologation purpose. The Speed Triple 1050R is a more powerful version of the Speed Triple currently on sale. In the looks department though, it is almost the same.The 1050R is powered by a 1,050cc, in-line, 3-cylinder, 12-valve petrol engine producing 135 PS of power and 111 Nm of torque matched to a 6-speed gearbox. 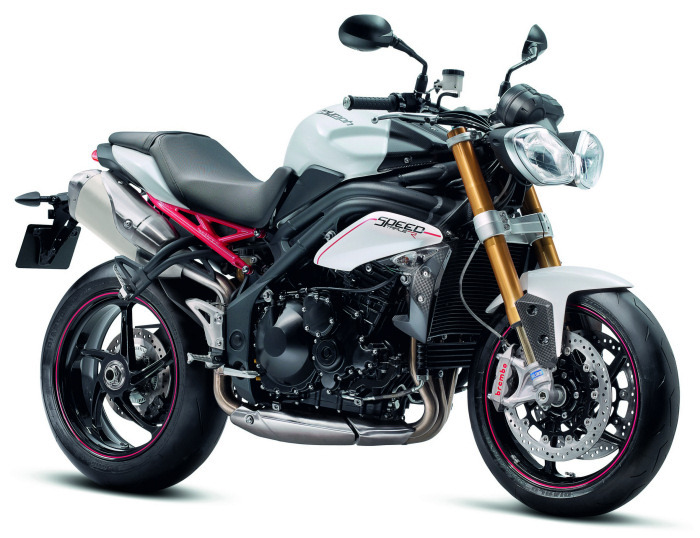 The standard Speed Triple currently on sale produces 126.7 PS & 104.8 Nm. The Speed Triple 1050R gets a 43mm Ohlins USD front fork & a Ohlins twin tube monoshock at the rear. There’s switchable ABS available as standard on this model.This model will be brought to India via the CBU route and pricing is expected around Rs. 13 – 14 lakh.